Horror on your doorstep has been done to death – homephobia and domestic dread are now staples of the genre – so how about horror on someone else’s? I expect this was the elevator pitch. Getting away from it all are Mother/ son combo Logan (Minette) and Naomi (Dalton), who are in trauma from a tragic event involving the man of the house. Unfortunately, they don’t have much money, as spelt out by Naomi’s constant eyes on the bills characterisation that’s present from her opening moments. Luckily, her sister has a big, picturesque house in the mountains that’s supposed to be empty. And they can borrow it, provided they go out during the day as the titular open house happens. It’s weird having so many strangers coming in to look around, but at least they’ll all go home at the end – right? Before too long there’s things going bump in the night, and the signs of a stranger in their midst. But if that’s the case, how come the police can’t find them? In short it’s a haunted house/ home invasion hybrid. 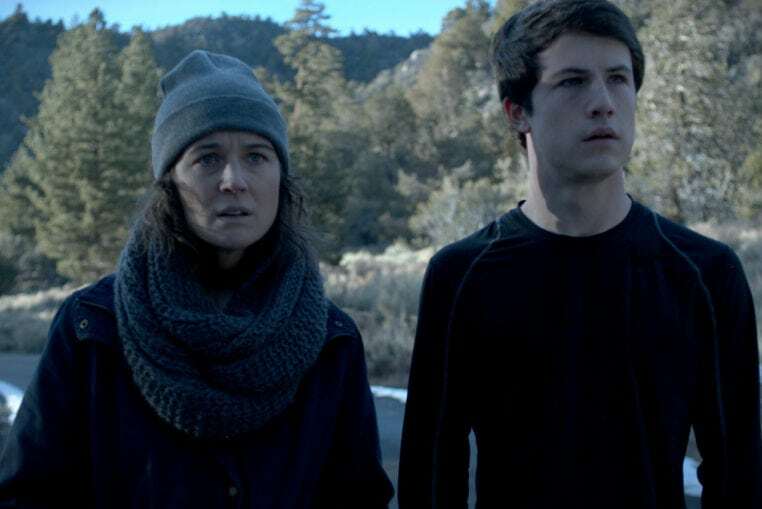 Last year Dylan Minnette starred in teen melodrama/ mystery 13 Reasons Why. As such, I can only assume his inclusion here was about turning an audience that don’t normally watch horror movies towards them. 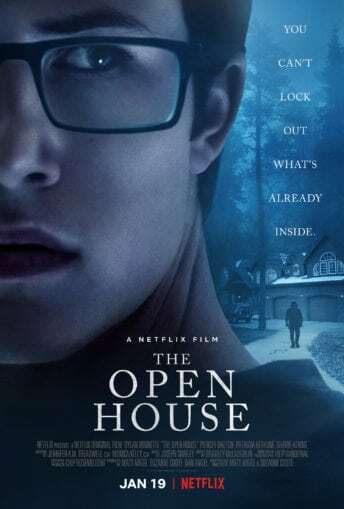 If so then an assumed ignorance on the fan base’s part may explain the horror by numbers approach of writer/ director team Matt Angel and Suzanne Coote. You got it all – dungy cellars, outlandish neighbours and a tragic backing story our leads need to come to terms with. 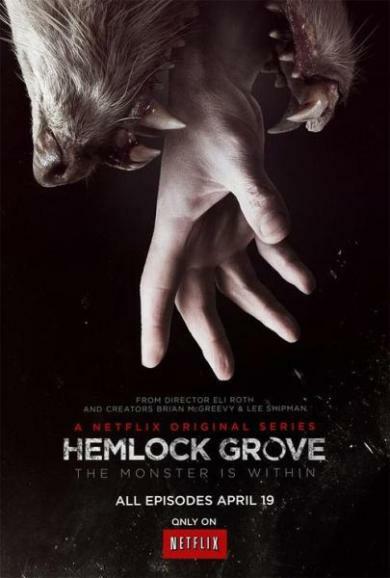 Throw in a recurring song (Rip Van Wickle by Shannon and the Clams), tracking shots over the woods, semi-frequent loud noises and nightmares/ vision aplenty. To be fair, there are a smattering of promising moments in act one, as the directorial duo establish location and tone. For instance, the first time we go into the bowels of the house is quite unnerving and the house itself looks great – offering plenty places for a person to hide. However, as it moves into act two it’s not able to up the threat effectively: there’s slow burn and then there’s The Open House. Supernatural horrors need to find a rhythm – a pace at which things get worse with each new fright. It doesn’t need to be fast, but it does need to be sustained. And whilst spooky things happen shortly after they’ve moved in, it’s almost 75 minutes before the horror gets escalated into anything much resembling tension. Until then, we’re mostly trying to work out the mystery of why mum’s shower keeps going cold. Indeed, there’s three separate scenes of the pilot light being lit after it’s gone out. Oh, and then Logan looks a little startled after something happens behind him. Many successful horrors do small scale terror well. Although they tend to do so by utilizing a familiar location, rather than what most would regard as a mansion, and building up some intrigue about just who the antagonist is, and what they want. Here, the mythology is extremely limited with most of the substance revolving around a fairly generic motif about dealing with past trauma and the reminder that you can’t escape your problems (cue numerous shots of Logan running). Maybe the only key graces of the film are its two leads who, despite the script, give their more heated exchanges a sense of drama – even when the strains themselves seem introduced from nowhere. Yet both are ultimately done a disservice by a third act that sees a groan-inducing twist followed by an unearned dénouement, which feels far lazier than it is shocking. To get there, there’s a shoal of red herrings which would be fine if there were a neat solution behind them all. But very little is wrapped up, with viewers being no closer to understanding why anything they’ve seen happen happened. To make it worse, there isn’t even a strong thematic resolution, meaning the two house sitters could be anybody and the content would be mostly unaffected. Netflix have presented some decent horrors lately. Just looking at last year, Gerald’s Game was stunning, Little Evil was fun, 1922 was accomplished (if forgettable), and McG’s latest The Babysitter was top shlock. So it’s frustrating to see them unshackled from the studio system, and the need to get their work on the big screen, with something so dull. I didn’t hate the film, but then nor did I like it at all. Rather it was badly built with a weak foundation – not worth visiting. 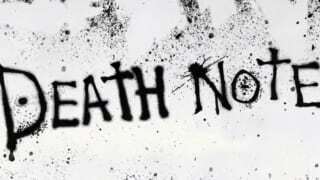 JUST IN: First teaser trailer for Netflix’s Death Note is released!